When I picked up Mikey from school on Friday he had an extra friend with him to spend the weekend. It was Clifford!! Apparently, this is something that the kindergarten classes do. They all pass around Clifford and he has many adventures. 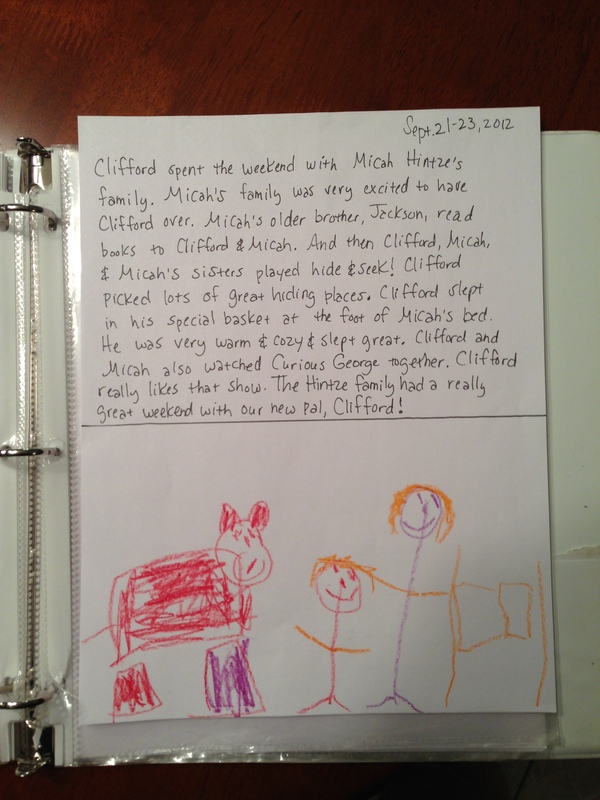 Then the kids and their parents write a story about their time with Clifford. Honestly, I was pretty grossed out thinking about how germy Clifford must be, but he smells better than our real dog so I just decided to get over it. Mikey had lots of fun with Clifford for the weekend and took very good care of him. We all had to talk about Clifford as if he was real and Mikey also tried to feed him string cheese. Guess it could have been worse. Could have been spaghetti or something. Anyway, here’s a couple of pictures of our weekend with Clifford, the big red (germy) dog. < Other things and first days of school ramblings.